You need to be a registered user before you can begin buying or selling with GunBroker.com. We will email you a registration code that must be used to activate your account. Do you want more detailed information before you dive in? If so, head over to Basic Training on the right, and choose a way to learn. 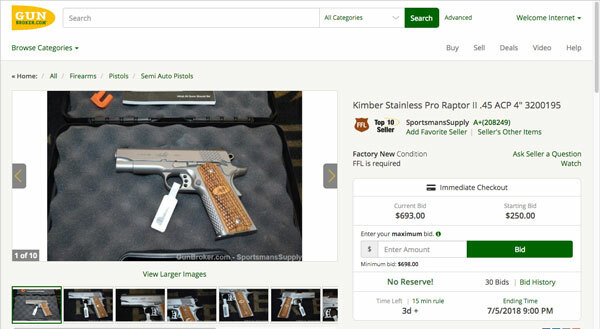 How do I bid on an item on GunBroker.com? 1. Scope out the special listings. 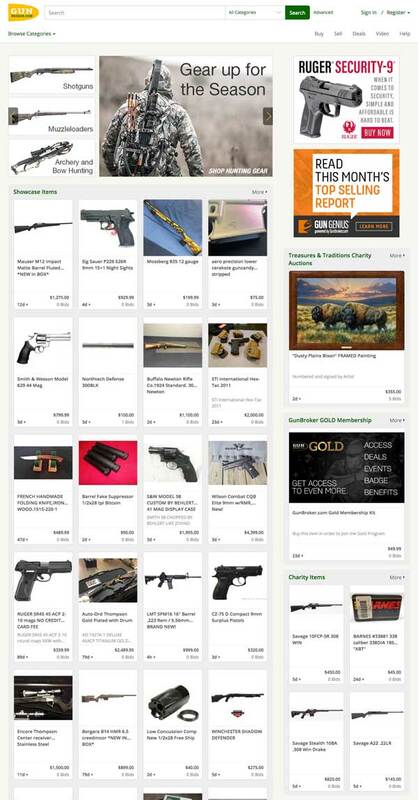 View the Showcase and Charity Listings on the GunBroker.com home page each time you visit. Browse the categories using the Browse Categories dropdown on the header to find gun collectibles, sport firearms, hunting gear, knives & swords, air guns, archery and gun accessories. See a complete list of GunBroker.com categories. 3. Pull the trigger – place your bid! You can follow the bidding on My GunBroker to make sure you win. How can I find a Transfer Dealer? How do I browse listings? How do I search for items and can I save my search criteria to use later? What is a Starting Bid and Reserve Price? What is a BuyNow! Price? What is a Fixed Price item? I won an item. Now what? How do I use GunBroker.com Checkout? GunBroker.com is an online marketplace for firearms and related accessories. 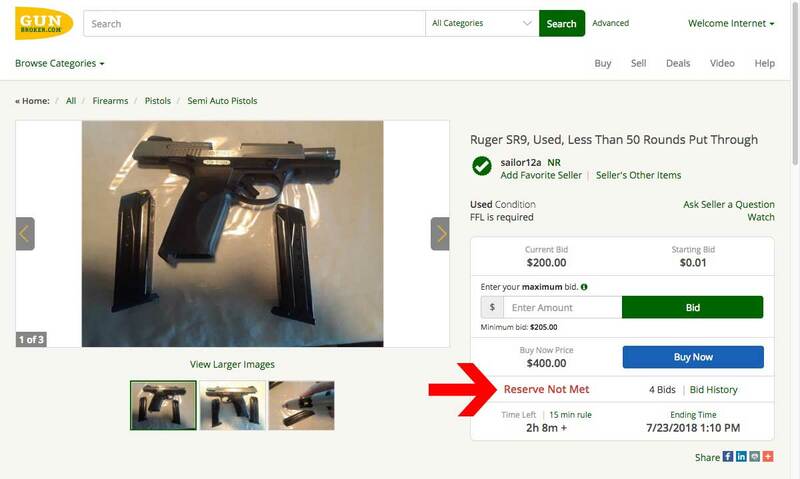 Sellers can list items for sale, such as gun collectibles, sport firearms, hunting gear, knives & swords, air guns, archery and gun accessories, and potential buyers can browse the listings and bid and/or buy the items. Expect to find a limitless number of top name brands from Glock pistols and Remington rifles to Benelli shotguns and Colt firearms. If you bid on the item and win it, you and the seller contact each other directly and make arrangements for payment and delivery of the item you won. 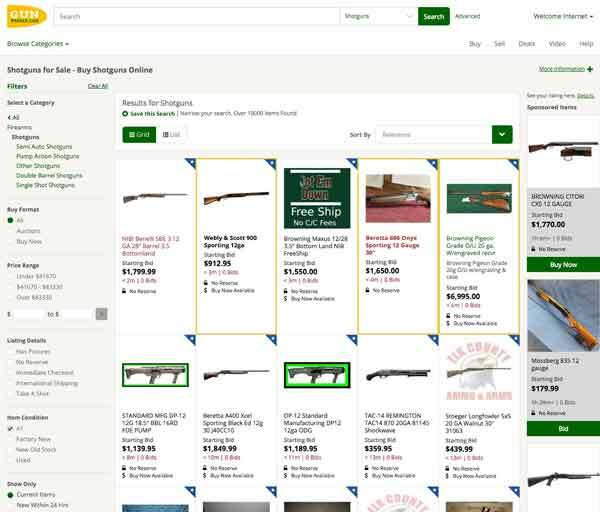 GunBroker.com manages the sale process, provides a convenient form of communication between buyer and seller, and offers rich, varied, and up-to-date information on the item being sold (often including pictures). 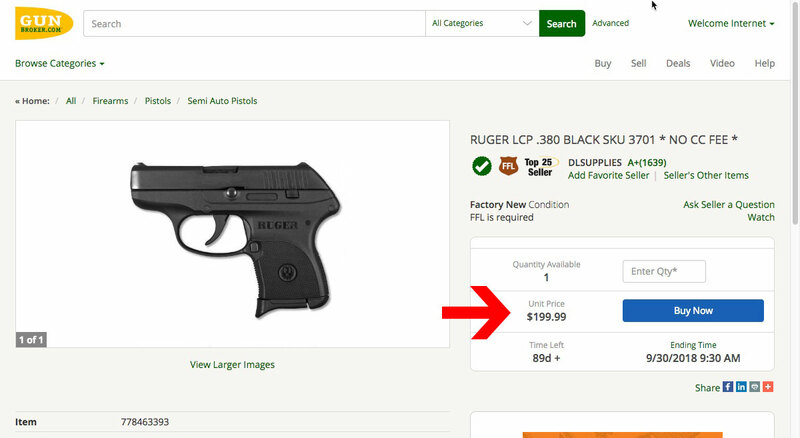 An important note: Aside from hats, shirts, and other promotional merchandise bearing our logo, GunBroker.com does not sell any of the items listed on this auction site. Anyone who is legally allowed to own firearms, ammunition, knives, and gun accessories is allowed to buy or sell them here. It is your responsibility to be in compliance with all Federal, state, and local laws when using this site. GunBroker.com has compiled a list of FFL Holders who are willing to manage the legal transfer of firearms to unlicensed persons. Find a Transfer Dealer. If you have any questions or doubts about whether an item can be shipped to you, please contact your local FFL Holder or send a message to the seller of the item by clicking on the “Ask seller a question” link located in each item listing. International buyers: Be sure you get all your information on exporting and importing firearms to the United States. See also: Shipping Guide, Gun Laws, ATF List of State Laws. Where do I find the site’s FFL Holder Network? GunBroker.com has compiled a list of FFL Holders who are willing to manage the legal transfer of firearms to unlicensed persons. You can browse this list by Zip Code or State using the Find a Transfer Dealer link located on the Tools for Buyers page. See our current FFL Holder Network Member List. Our system is very simple! Browse the listings and bid on items you intend to purchase. A winning bid is the highest bid that meets or exceeds the Reserve Price. Some items have a BuyNow! Price. You can purchase those items immediately by clicking the BuyNow! button. You can monitor your bid on My GunBroker to ensure that you increase your bid to win the item. ↑ Back to List To place a bid on this site, you must first register with us. We charge no recurring membership fees. 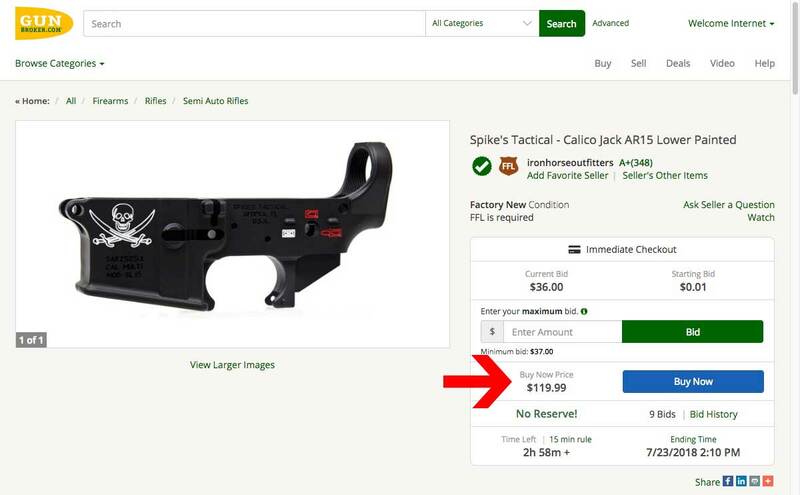 There are no fees to bid on an item; GunBroker.com does not charge a buyer’s premium. The Buyer pays the Seller directly for the item they purchase. GunBroker.com is committed to your safety. We are the only firearm related online auction that offers Buyer’s Protection. No other firearm internet dealer, gun collectibles online trader or classified ads (in print or offline) provides any form of protection against fraud. Always check the seller’s feedback rating before placing a bid on an item. You can use View User Feedback located on our Tools for Sellers or Tools for Buyers pages. There is also a link to the seller’s feedback on the View Item Page. Pay by credit card if possible. Credit cards give you specific legal rights in the event there is any problem with the transaction. If you do not wish to use credit cards, pay by US Post Office money order and send payment by US Mail. The Post Office is a strong resource in case of any problems. For items whose cost exceeds the limit of our Buyer’s Protection ($500), we strongly urge you to consider using an online Escrow Service. For a reasonable fee, they will hold your payment until you receive your purchase, and then will forward payment to the seller. You should think twice before using electronic payment systems like PayPal. With these services not only do you typically not have any rights if the transaction goes bad, you lose your ability to file a mail fraud claim because you are not “mailing” a payment. 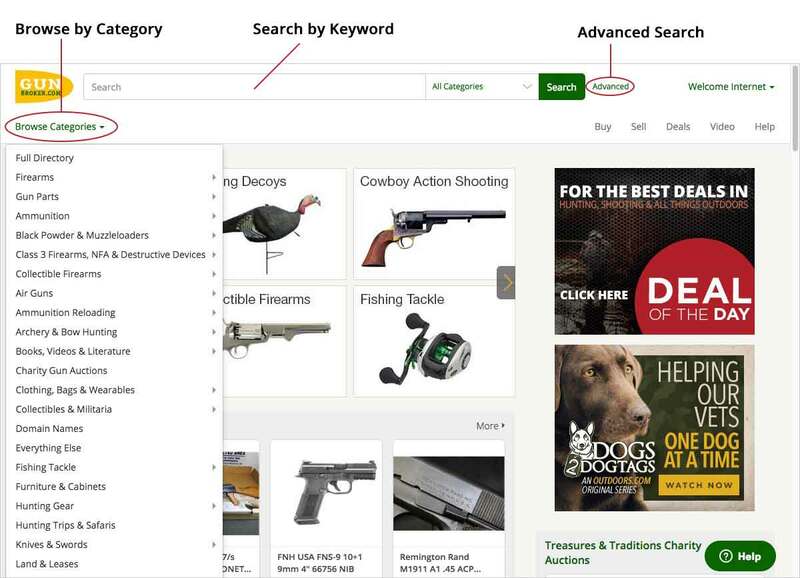 There are two ways to shop for listings on GunBroker.com: Browsing and Searching. Our home page contains a list of categories that will display by hovering over the “Browse Categories” button. To see the items contained within a category, click on the category name. This will bring up a list of items within that category. If a category has subcategories, the master category will contain the items listed both in itself and in its subcategories. For example, “Firearms” is a master category containing Pistols, Rifles, Shotguns, Cowboy Action Shooting and Class III items. If you click on “Firearms” you will see all of the pistols, rifles, shotguns, etc. contained within all those sub-categories. You can search for the firearms, ammunition, knives, and gun accessories you are interested in by using the Search box located in the top header of all pages. You can access our Advanced Search page by clicking on the Advanced button located at the top right of each page. We have detailed information on how to use our search effectively on our Search Tips page. See also:Search Tips, Searching and Sorting, Advanced Search. After you search or browse, a list of results will appear. This page has several options to filter the results to help you find what you are looking for. Results can be filtered by additional criteria by using the column to the left of search results. On a mobile device, look for the filter icon. Filter your results by subcatgory, buying format (auctions versus buy now), condition (new versus used) and price range. Once you select a terminal category, more filtering options will appear. If you are interested in a particular type of item and you would like a way to be notified when a matching item is listed for sale on our site, you can create a Saved Search. Saved Searches can then be run at any time using My GunBroker. Use any of the Search boxes located throughout our site to generate a search result. As an example, enter “Colt 1911” into the search box in the header at the top of the page and click the Search button. The results of your search will be displayed in list view on the Search Results page. At the top of the search results, you will see green text that says “Save this Search”. This opens a dialog box that will save your search into your Favorite Searches section in My GunBroker. If you would like to be notified via email when an item is listed that matches your search, select the “Email” checkbox. You can run the saved search anytime by going to My GunBroker > Favorites > Searches. Advanced Search gives you more control over what you are searching for. 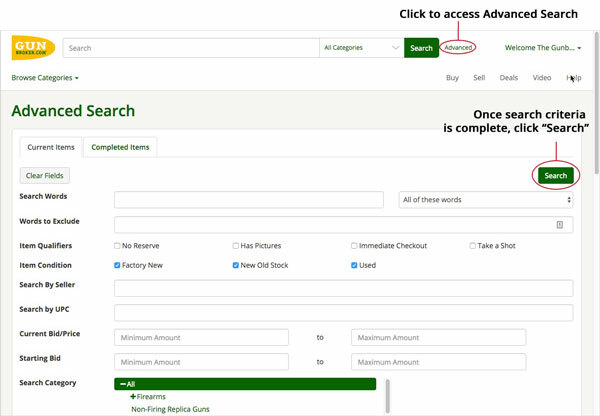 Using Advanced Search, you can specify your keywords, select what you are looking for (items, sellers, item number, etc), and select the categories you wish to search. You can access Advanced Search by clicking on the Advanced button at the top right of every page. After inputting your criteria, click the Search button to generate results. Search for items from a specific seller. Search by the item’s location by selecting USA State or Country. Search for an item number by inputting the item number in the Search Words box. Search for completed items on GunBroker.com by selecting the “Completed Items” tab. A Starting Bid is the least amount you can bid in an auction. As the name implies, it is where bidding starts. You cannot place a bid lower than the Starting Bid. If an auction has a Starting Bid and no Reserve Price, the high bidder on the item will win the item at auction close. Every auction has a Starting Bid, even if the Starting Bid is $.01. Example of an auction with no reserve and a starting bid set at $250: The current bid would win if the auction were to end now. A Reserve Price is the lowest acceptable price to the seller. The Reserve Price is kept secret from the bidders. You can place a bid that is lower than the Reserve Price, but the item will not be sold unless bidding meets or exceeds the seller’s Reserve. You can identify Reserve Price auctions by the red in the item title and by the words ‘Reserve Met’ or ‘Reserve Not Met’ next to the Current Bid in the item listing. See also: Reserve Prices. Example of an auction with a reserve price: The current bid would not win if the auction ended now. Some items may have a BuyNow! price. The BuyNow! Price is publicly posted in the item listing. If the item has a BuyNow! Price you can immediately purchase the item for the BuyNow! Price without placing bids and waiting for the auction to close. See also: BuyNow! Price. Example of how a BuyNow! price displays in the View Item listing: The current bid would win if the auction were to end now. list multiple of the same item for sale at one time, in one listing. Buyers can buy one or many up to the quantity available for sale. the remaining quantity available for others to buy. purchase that quantity at the selling price per item. Example of how a fixed price displays in the View Item listing. See also: What is a Fixed Price Item?. You must be a registered user to place a bid, but you can easily Register with GunBroker.com. When you have found the firearm, ammunition, knife, or gun accessory that you are interested in, you can place a bid on the item. You place your bid from the item listing page. Right after you place a bid on an item we show you the status of your bid. If you place a bid that does not meet the seller’s Reserve Price, we will tell you that. If you are outbid by another bidder using AutoBid, we will tell you. If you are outbid for any reason, you are no longer obligated to buy the item. You are then free to bid again or pursue another item. When you place a bid, we send you an email confirming your bid. If another user outbids you, we send you an email message telling you that you have been outbid. However, Internet mail is not guaranteed delivery; just because we sent the message does not guarantee that you received it. 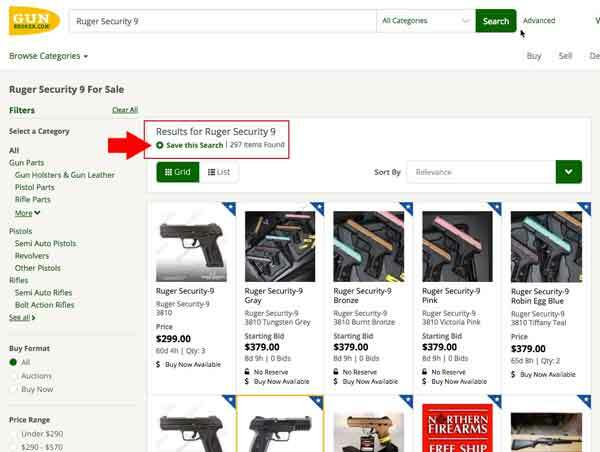 You should check on your auctions using the My GunBroker page to keep track of your items. See also: Bidding, Placing a Bid, Bid Increments, Being Outbid. Our auction site has a feature called AutoBid. When you place a bid on an item, you are entering the maximum amount you are willing to pay for an item. AutoBid always bids the least it can to win. When you are outbid, AutoBid will raise its bid. It will never bid more than your maximum. If the item has a Reserve Price, AutoBid will attempt to meet the Reserve Price. To use AutoBid, simply enter the maximum amount you are willing to pay for the firearms, ammunition, knives, or gun accessories in the bid amount field when placing a bid. If you place a bid and the bid posted is less than what you thought you bid, it is most likely due to our AutoBid system. Learn more about AutoBid. Our auction site automatically keeps track of items you have bid on, listed for sale, sold, and won. You can access the information using My GunBroker located at the top of any page. Details about the items you are bidding on will display in a list on My GunBroker. My GunBroker is a powerful tool for managing your items. See also: All Buying Overview, Using the Show Items I’m Watching View, Using the Show Items I’m Bidding View, Using the Show Items I’ve Won View, Using the Show Items I Didn’t Win View. If you win an auction, we send you an email at the end of the auction that contains the seller’s user name and email address along with your winning bid amount. If you think you won an auction and did not get your notification, check the ‘Items I Won’ section of My GunBroker. If you have won an auction and did not get your notification, please request help by navigating to our Help Center. From the time the auction closes you have a maximum of five (5) days to contact the seller at the email address located in the notification we sent you. The seller must contact you as well within the same five days. The seller will send you instructions on making payment and will request your address for shipping. Typically you will be required to prepay using a money order, although some sellers will take credit cards, personal checks, COD, etc. Make sure that you follow the seller’s payment instructions carefully. We suggest that if possible you use a US Post Office money order and send payment by US Mail. The US Post Office may be able to help you in case of problems with the seller. When sending payment, always include your name, address, phone number, the item number of the auction you won, the name of our site (GunBroker.com), and your email address. Many problems are the result of the buyer sending a check with no other information! If your item is a firearm, you will need to get a copy of your transfer dealer’s FFL license, signed by the dealer in blue or red ink, and enclose that with payment. You may need to send proof of age for other purchases; again please follow the seller’s instructions carefully. See also: Winning an Auction. Details about all of the items you have won will display in My GunBroker. Using My GunBroker, you will be able to manage your post-sale activities, such as viewing Seller Contact Info and leaving feedback. At the completion of your transaction, you should post feedback on the seller. Feedback lets other users know how the seller handled his transaction with you. When posting feedback, please be honest and unemotional about the transaction. The seller gets the chance to reply to your feedback, and you can post a follow-up to his response. While reviewing the user’s feedback, you can delete or change the feedback you posted on that user or post a follow-up to his response. Use the Submit Feedback form located on the Tools for Buyers page. If you cannot get in touch with the seller within the five-day window, you do not receive item in a timely fashion, or you are having some other problem with the seller, please go to our Resolving Problems with the Seller tool. We will help you get the issue resolved. Navigate to our Resolving Problems with the Seller tool on the Tools for Buyers page. The GunBroker.com Checkout system is designed to assist the buyer and seller in completing the transaction. Checkout does not replace the item/auction format, but is a pipeline after the item/auction has ended to capture information required to complete the transaction, such as billing and shipping information. Not all sellers use the GunBroker.com Checkout system. For sellers that do, you will find links to go through Checkout for a listing at the top of the view item page (once the listing has ended) as well as in the drop-down menu of the “Won” grid in My GunBroker. The steps of the Checkout process will vary based on the amount of information provided in the listing by the seller and whether or not the seller accepts payment directly through the Checkout system. If the seller has not specified all the costs associated with the listing ahead of time (shipping costs, tax, etc.) you as the buyer will have a chance to review and confirm the costs once the seller has added them to the order. You can find the orders you have placed in the “Won Order” grid in My GunBroker. From there you can do things like view the orders status, print an invoice, and track the order if it has been shipped. To learn more about the GunBroker.com Checkout system please read the Checkout Overview.